Chelsea will be in the hat for the UEFA Women’s Champions League last eight for the first time ever, after comfortably seeing off Rosengård 4-0 on aggregate. 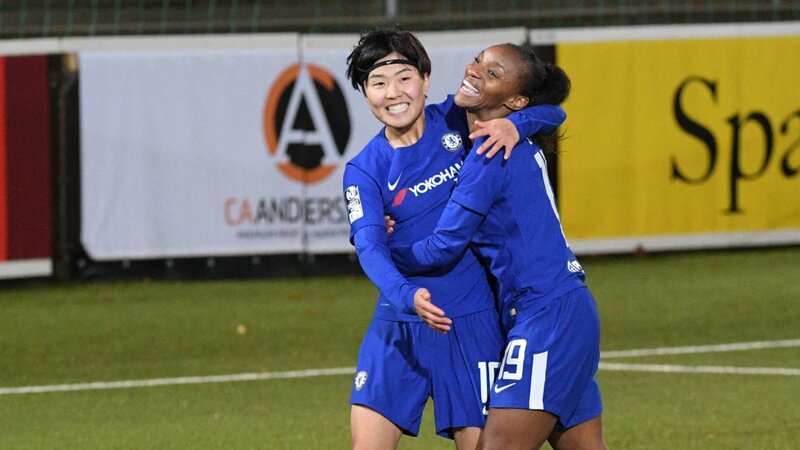 Chelsea successfully protected their 3-0 lead to half-time at Rosengard, with only a Sanne Troelsgaard chance or real concern, while at the other end Ji So-Yun forced Zecira Musovic to turn the ball away from the bottom corner. Any doubt about the Blues progressing was ended 8 minutes into the second half, when Crystal Dunn fed Ji, whose deflected effort could only be helped into the net by the keeper. Maren Mjelde might have added to the the score but headed a free-kick over and failed to net when one-on-one with the keeper, Musovic also denying Fran Kirby when tipping her drive over the top. Wolfsburg began with a 4-0 advantage over debutants Fiorentina but the Italians bowed out with a creditable 3-3 away draw. Ilauria Mauro had them ahead 2 minutes in but Tessa Wullaert scored twice in as many minutes. Precellia Rinaldi made it 2-2 on the night, Sara Bjork Gunnarsdóttir restored Wolfsburg’s lead before Ellie Brazil equalised. Linköping took an aggregate lead over Sparta Praha with a Lina Hurtig effort on 18 minutes. Goals from Kristine Minde and Nicoline Sørensen added one each in the final dozen minutes for a 4-1 score overall. Barcelona coasted through to the quarter-finals with three goals against Gintra, adding to their six in Lithuania. Alexia Putellas and Toni Duggan were on target by the break, with Ana Alekperova conceding an own-goal later on. Montpellier only brought a narrow 3-2 lead back to France but the hit the Italians for six. Anouk Dekker, Sofia Jakobsson and Katrine Veje got the first-half goals, with Sandie Toletti, Marie-Charlotte Léger and Virginia Torrecilla later adding one each. Brescia substitute Tecla Pettenuzzo lasted less than 10 minutes on the field, receiving two cautions in that time. Already seven up from the away leg in Kazakhstan, holders Olympique Lyonnais showed no mercy to BIIK Kazygurt, as they finished up 16-0 aggregate winners. Ada Hegerberg hit four goals in a 26-minute spell, there was a hat-trick for Camille Abily, plus one apeice by Amel Majri and Delphine Cascarino. Thursday brings the two remaining ties, as Slavia Praha defend a 2-1 advantage over visitors Stjarnan and Manchester City host Lillestrøm with a 5-0 first leg lead. The draw for both the quarter-final and semi-final stages will be made on 24th November.